Who doesn't love brownies? No one! Mark loves brownies, with pecans of course, so he thought this was a great challenge. These came together quickly, no mixer required, which I liked. As soon, as I ate one, ok, two, I knew I should have made a double batch. Next time. Spray, or line with parchment paper, an 8" x 8" square pan or glass dish. Combine the butter and the 8 ounces of chocolate. Melt in a bowl set over simmering water on stovetop. Do not burn or scorch. When melted, add the cocoa powder, espresso powder and cayenne pepper. Let cool. In another bowl, combine the beaten eggs, sugar, salt and vanilla. Add the chocolate mixture and stir. Add the flour and stir just until combined. Add pecans if desired. Pour into prepared pan. Bake for 35-40 minutes (in my oven it took 40 minutes.) 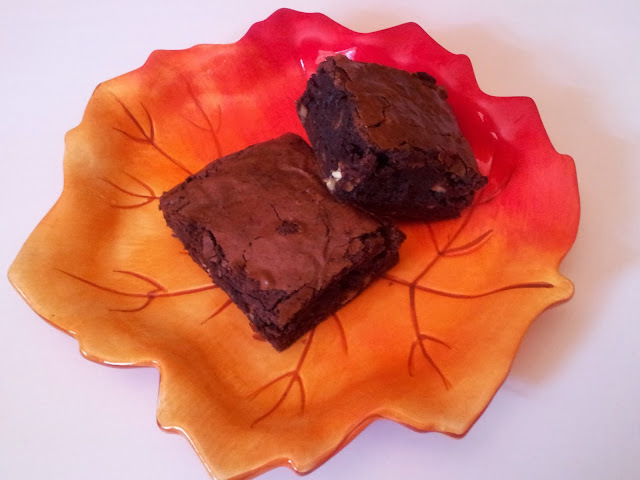 When a toothpick inserted in the center of brownies comes out slightly moist, they are ready. Do not over-bake or they won't be moist. When completely cool, cut into squares and stand back, because everyone loves brownies!